RSS: Awesome for people with too much to do. I send out an email to my mailing list every single week. But I never write an email. In fact, most weeks, I never bother to log in to my email service provider account. (When I do, it is only to see how a particular email performed, not to compose a new email.) If you find yourself spending a lot of time writing your email newsletter each week, you’re going to love this trick because it will save you time. I’m going to teach you how to automate your email newsletter using the RSS-to-Email feature. Don’t get me wrong, I do write every week. I just don’t write my email newsletter. Instead, I spend my time writing blogposts on my website. There are a lot of advantages to writing blogposts instead of emails. For a full discussion, see my my column in All Access. Bottom line: it saves time, boosts your site’s ranking in search engines, and makes your email reports more insightful. RSS stands for Real Simple Syndication. Have you ever seen the little orange icon with two white radio waves? That’s the RSS symbol. 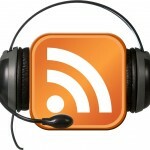 There are two components to RSS: An RSS reader, and an RSS feed. Think of an RSS Reader as a television set. RSS feeds are like cable channels. Most news sites and blogs have RSS feeds. You can use an RSS reader app like Feedly to plug in the channels that you want. For example, if you wanted to combine the sports section from your local newspaper, the posts from your favorite food blog, and the front page of the New York Times all into one place so they’re easy for you to read, you can do that. All you have to do is to subscribe to each RSS feed in your reader and, ta-da! You’ve got a website customized just for you. So what does RSS have to do with your weekly newsletter? Simple: You can plug the RSS feed from your own website into your email service provider and tell it to automatically create and send an email newsletter from it. With my site, SethResler.com, I am using Mailchimp to pull my blog’s RSS feed and send out an email every Wednesday with my latest blogposts. In other words, when I write my blogposts, I am also writing my emails. I build all of my websites in WordPress. I advise radio stations, particularly those without a big budget, to do the same. WordPress has RSS support built in to its platform. However, even if your website is built in another platform there’s a good chance it has an RSS feed for the blog built in. Check with your webmaster. Mailchimp has long been my top choice for managing my email list. There’s a number of reasons for this, including the fact that it’s free for smaller lists. But the main reason is that Mailchimp pioneered the RSS-to-email feature. However, many other small business email service providers now offer the feature, including AWeber, GetResponse, and Campaign Monitor. In short, while I’m going to show you how to set up an automated campaign using WordPress and Mailchimp, you can do it with other tools. The two things you need are (1) a blog with an RSS feed and (2) and email service provider that has RSS-to-email capabilities. What if I Don’t Want to Include All of My Blog Entries in the Email? With WordPress, you assign a Category to each blogpost you write. For example, you might create the categories ‘Morning Show Recaps,’ ‘Contests,’ and ‘Concert Previews.’ WordPress provides an RSS feed for each category. So if you only want to include the blogposts in your Contest category each week, you can — just use the RSS feed for that category. Feeling adventurous? 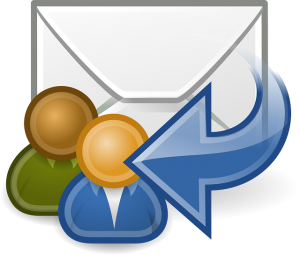 Create different automated email campaigns for different mailing lists. For example, when listeners sign up for your email list, you could give them the option of signing up for a daily Morning Show Recap email, a weekly Concert Preview email, or both. 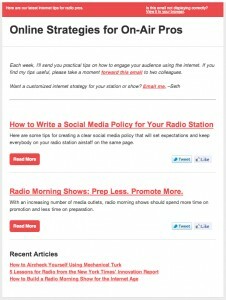 Now, create two RSS-to-Email campaigns: one will send daily using posts from the Morning Show Recap feed, the other will send weekly using posts in the Concert Preview category. Another alternative is to create a WordPress category specifically for the posts that you want to include in your email newsletter, and set up your email campaign using the RSS feed for that category. I use this technique for my other website, Taste Trekkers, where I only send out one automated email per month. We post too many blog articles to include in one email, so instead I have a WordPress category called “Featured in Email.” I check that box if I want a particular post to be included in the monthly email. As you can see, RSS-to-email allows you to automatically send multiple, highly targeted emails without lifting a finger. Enjoy! Hey Seth! 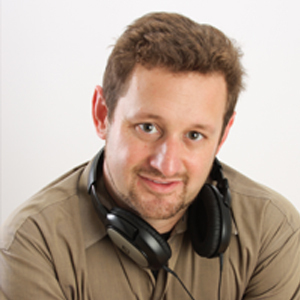 I need a radio station webiste – what is a good WP theme to use? i am also starting a small FM station and have purchased the StudioPress package and plugin. Which of the StudioPress themes do you feel would be a good fit for a radio station? When choosing a child theme, I usually look at the layout and navigation. The colors can easily be changed by a graphic designer who knows CSS. But moving huge sections of the website around is much more difficult.